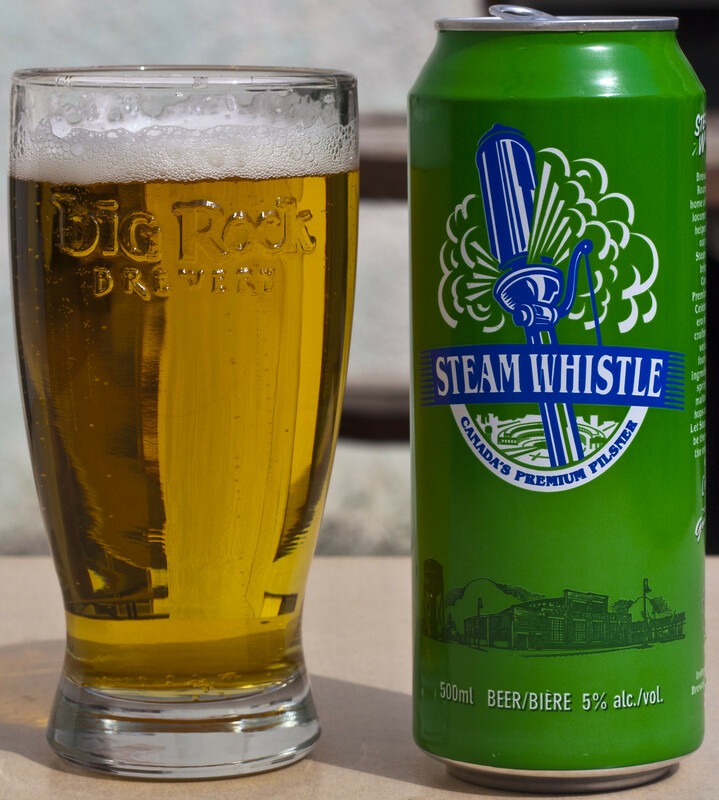 Steam Whistle may be the only Canadian brewery that I know of that makes one beer, and only one beer. In this case, Steam Whistle Pilsner. Most breweries have a main staple, but produce 3-4 others along side, but nope, not for Steam Whistle! Steam Whistle is now available in Manitoba in 500ml tall cans for $2.95, which is about average for a Canadian macro/micro tall can. Aroma: A sweet maltines. I'm not a fan of malty golden lagers or pilsners. Somewhat grassy aroma. Taste: Pretty boring. Reminiscent of Port Royal Export to me. Tastes a bit like hay, a slight amount of skunk, malty, sweet and a minimal amount of bitterness from the hops. Overall Thoughts: At $2.95 it's an alright value, but not even close to being the best pilsner I've had. Steam Whistle is a bit too malty for me, but trying to break down the flavours and I do notice a bit of hops, more than the standard pilsners, which I appreciate. I wouldn't buy this again unless if I wanted a camping sort of beer, or to share with friends. This would be a great camping accompaniment by the fire, especially if you can't bring glass with you. I prefer Moosehead, but it's better than some other golden lagers or pilsners out there. It has 5% ABV, and I just noticed on the side of the can it states that can was packaged on March 22, 2012, so one day away from being exactly one month old. I like knowing when my beer was made, so props to you Steam Whistle! What was the date on the can?